This book brings ethnographies of everyday power and ritual into dialogue with intellectual studies of theology and political theory. It underscores the importance of academic collaboration between scholars of religion, anthropology and history in uncovering the structures of thinking and action that make politics work. 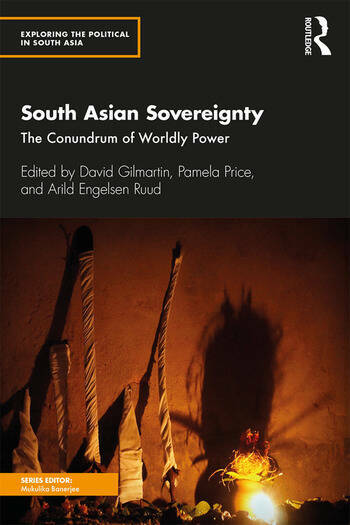 The volume weaves important discussions around sovereignty in modern South Asian history with debates elsewhere on the world map. South Asia’s colonial history—especially India’s 20th-century emergence as the world’s largest democracy—have made the subcontinent a critical arena for thinking about how transformations and continuities in conceptions of sovereignty provide a vital frame for tracking shifts in political order. The essays deal with themes such as sovereignty, kingship, democracy, governance, reason, people, nation, colonialism, rule of law, courts, autonomy and authority, especially within the context of India, Bangladesh and Pakistan. The book will be of great interest to scholars and researchers in politics, ideology, religion, sociology, history, and political culture as well as the informed reader interested in South Asian studies. David Gilmartin is Distinguished Professor of History at North Carolina State University, USA. His current research focuses on the legal history of India's electoral institutions as they have evolved from a colonial past and changed in relation to evolving visions of the people’s sovereignty. His earlier books include Blood and Water: The Indus River Basin in Modern History (2015), Civilization and Modernity: Narrating the Creation of Pakistan (2014); and Empire and Islam: Punjab and the Making of Pakistan (1988). Pamela Price is Professor Emerita of South Asian History at the University of Oslo, Norway. She began her research on political culture working on colonial south India and has published, among others, Kingship and Political Practice in Colonial India (1996). Moving onto postcolonial topics, she edited Power and Influence in India: Bosses, Lords and Captains (2010, with Arild Engelsen Ruud). A collection of her articles appears in State, Politics, and Cultures in Modern South India: Honour, Authority, and Morality (2013). Arild Engelsen Ruud is Professor of South Asia Studies at the University of Oslo, Norway. He writes on issues of democracy and politics in South Asia, specifically West Bengal and Bangladesh. He is the author of Poetics of Village Politics on West Bengal’s rural communism (2003), co-editor of Power and Influence in India (2010, with Pamela Price), and co-author of Mafia Raj (2018, with Lucia Michelutti et al. ).